It's an impressive curve. Curves are hard! Especially with the 4" cube rule. I really hope you are at least getting a small sense of pride from your builds. They are great - different and full of personality. That curve looks really good! Quite a unique design. I didn't cut it out very well, so it's a bit iffy (first time using anti-clockwise tin snips). Can't tell from looking at it, tho. 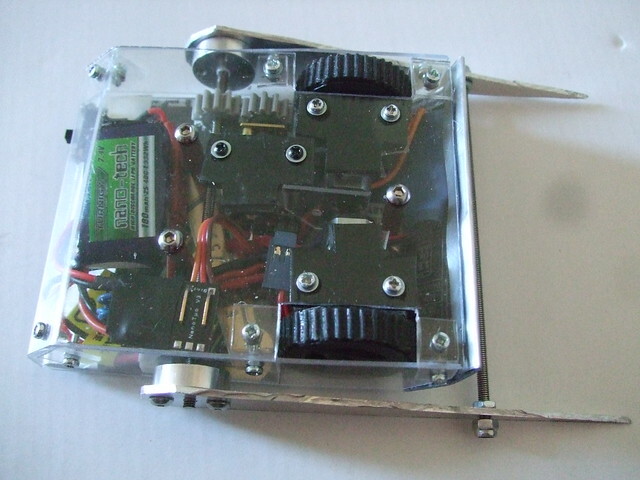 For the 4" box rule, could the bot be considered to fit if its spikes are pointing diagonally? 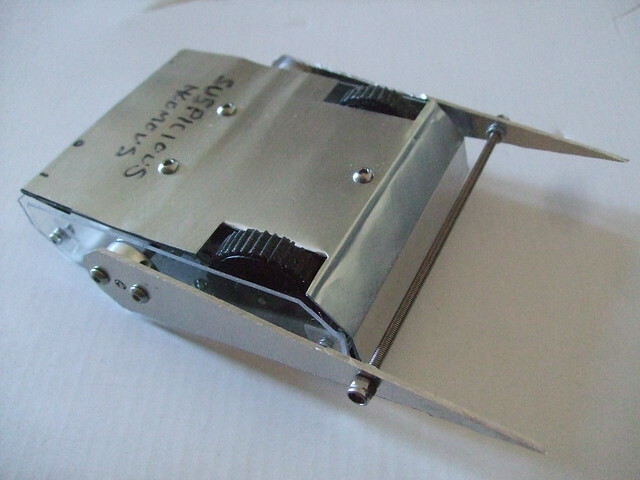 The main body easily fits on the bottom of the box, and with 85mm spikes pointing forward, it fits diagonally, but if it sits on the bottom and angles the spikes into the corner then they can be an extra 20mm long. I think it's allowed, as they're moved mechanically, but I thought I'd better check. I guess it'd have to start every match with the spikes pointing skyward, but that's no bad thing because it'd look awesome as a result. . I'm quite looking forward to finding out what kind of gymnastics it can get up to, too..
Yup, you are correct, it's absolutely fine as long as the spikes start in the position they fit in the cube in. Yeah.. there might be a reason for that - it doesn't leave much usable space when it's all curves and angles! Last night I attached the front flipper and the servo, but there was so little room left after adding the battery that the servo arm could barely move. I refuse to give up on the melon, but I also refuse to make it a rear flipper, even though that would work. No, I have a new plan, and the more I think about it, the more the plan feels right..
Plan D.2[s4] is HAMMER TIME! I'm thinking the hammer should sit right at the top, with the front of the bot now being the rind. I'm sure that if a slice of melon got angry, it would face it's enemies with the toughest bit first, eh? Thanks for the wheel advice. Interesting to see the orange wheels in a narrower form. My problem wasn't the wheels, tho - it was the D-shaped axles for them to fit onto, which I've now sorted. I've spent a few evenings rebuilding Suspicious Houmous from the ground up. It's not much different to the old one, but it's a little bit more accurately built. Due to a bit of an 'it'll do' approach to measuring the length of the polycarb, it's wound up 5mm shorter, and the way i attached the tabs for the sides means that the blades are now further back than before. This has caused a bit of a space issue inside, and now I can't get the Vex29 to fit anywhere. I'm sure there must be a way of doing it.. its so close to fitting! The other shape in that photo is my newest attempt at Fermented Melon. The shape's good, but I made it out of aluminium, which makes it too heavy and won't leave much weight for the axe. It needs to be a glass hammer, but having the axe arm at the top might make it a bit unbalanced.. I guess I just need to make it out of thin polycarb and see what happens! 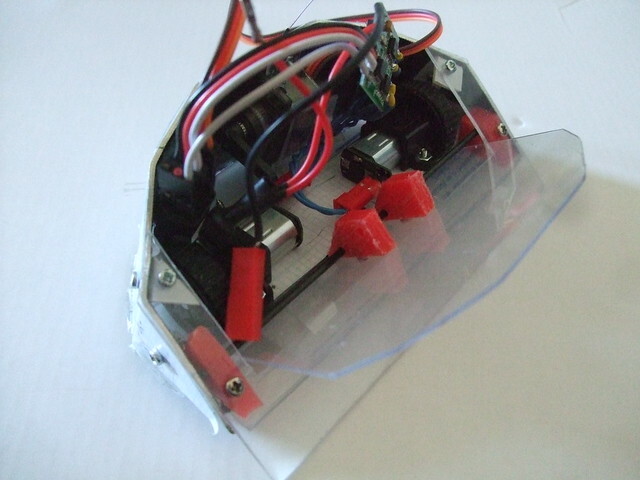 edit: before anyone asks, yes I have removed the casing from the Vex 29.
edit 2 (19th Jun): It fits! It just needed a fresh(ish) brain and bit more component tetris. The next worry is weight! With the film still on the polycarb, no brace bar across the lifters, and 12 missing M3 bolts, it's 148g. I might have to use thinner polycarb on top, and bolt some armour on the weakened front. Or just drill random holes in everything. Not sure if you've already considered these weight saving options, but it looks like you're planning on using 4 bolts to hold on each lifter, which would be overkill, so you could save weight by only using 2 per side there. Also it looks like you're using my favourite technique of holding the bot together with standoff posts, I can't see which ones, but if they're brass or steel you can save plenty of weight by switching to aluminium or nylon. Look forward to seeing these next week! Fear not! I initially thought I'd need four bolts, but after messing up the drilling, I realised two were enough. Also, yus - I am using aluminium standoffs. I pinched that idea from you, to be honest. Last night, I attached all the electrickery. 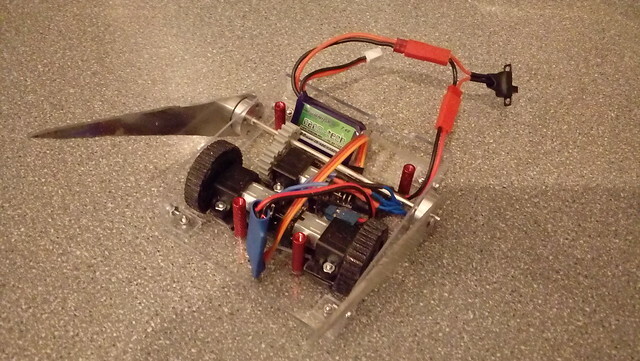 It's got a NanoTwo V3 connected to two 50:1 motors from HobbyKing (so I doubt they're Pololulu), a Vex 29, and a 259:1 motor. I upgraded my Devo 7E and bound it, and turned it all on, aaand.. it works! It drives, and that's good, but the arms are powered by the.. er.. left-hand uppy downy control (elevon?). It's just about usable, but it requires -100 when the TX is turned on, and it failsafes to -100, both of which cause the arms to rotate and throw the robot about. I'll have to alter a few settings somewhere, and find a screwdriver that fits the screws on the TX so that I can rearrange the springs. Also, the bot is indeed overweight. Only 3 grammes, but it still needs sorting. I think the top armour has to be reduced to flimsy 1mm. Cruddy, but I might be able to add in some things that I've had to drop. Can you even see the shape of the bot? TX sorted! Didn't expect it to be so easy, tbh. Failsafe still needs fixing, tho - it's not meant to make the bot more dangerous! Something's changed, though.. when I last used it, it was able to flip itself over and over (unintentionally - the failsafe caught me by surprise! ), but this time the lifters ran out of oomph. It seems the previous acrobatics caused one of the gears to loosen up, so it just spins on the bar instead of rotating it. Hopefully some araldite will fix it in place. bit of an update for anyone who cares (so probably just for my own benefit!).. It turned out that the weight, loose gear, and non-fitting battery weren't the only issues with Suspicious Houmous. It was also too wide! I'd forgotten that the width was a guesstimate, and one that didn't include the bolts poking out. With everything assembled, it was 106mm wide. So, I'm rebuilding it yet again! This time I'm using 1mm polycarb all over, with some thicker stuff for structural parts, I'm narrowing it by 10mm, and lengthening it by 10mm. at least doing it all in 1mm is relatively easy, and the weight shaving will hopefully allow the addition of a wedge to connect the lifter blades, and an LED or two. and some paint. all this would be easy if I wasn't also working on Fermented Melon, which has now reverted back to being a front flipper. Relatively boring, possibly, but easier in the time constraint. It turns out that the revised, angled rind allows for components to be mounted on the rind instead of being stacked on the base, so it now all fits! So, with all this building and no practise, expect me to be driving like a sozzled granny on the day. I'm already using the diagonal for getting reach on the lifters, which are at 45 degrees in the box. It's no big deal - I had to rebuild the armour anyway, for extra length (for fitting the battery) and for a weight reduction. I'm up to the really important bit, now - decorating! ugh.. i spoke too soon. I forgot I had to sort out the failsafe! i went to test it tonight, but I've ran into a problem with the NanoTwo V3; it's stopped working! It was working fine last night, but tonight it dimly flashes red once when power is supplied, and then it does nothing. I've disconnected everything apart from the motors, as they're soldered on. The wires don't seem to be shorting out anywhere, and the battery's fully charged. I might have to unsolder the motors, in case they're the issue. I'd rather not, tho. I'm not going mad, am I? It's supposed to flash while there's no signal from the TX, and constant while there is a signal? Well, AWS 55 was a fun event! Apologies to anyone who tried engaging with me for being slightly incomrehensible and possibly seeming a bit antisocial. I started the day in a bit of a panic, and didn't really stop until I got home again. It didn't start well.. I'd only partially tested the lifters due to the power issues, and it was lifting fine for the one or two tries I'd had the night before, but I tried to demonstrate it to my son on Saturday morning, and it couldn't lift anything! The gear on the motor was now slipping. There wasn't time to araldite it this time, so I just had to leave it partially disassembled and leg it to the car. The journey wasn't too bad, I guess. 50mph limits on most of the M6, but at least it was flowing. It wasn't really relaxing, as I was constantly clock watching, worrying that I'd miss tech check. We found the venue really easily (lovely location! 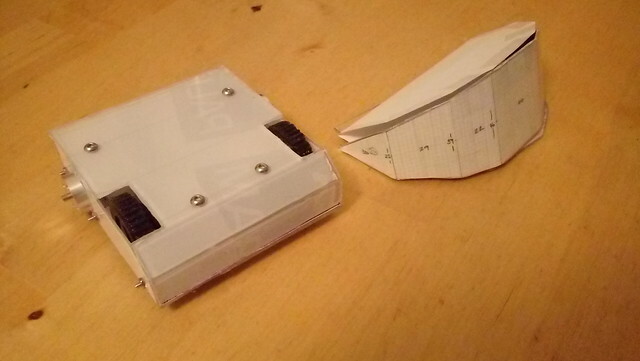 ), and I had a few minutes to reassemble the bot for the weigh-in (143g), and the cube check (only very narrowly fitted). Thanks to Dave and Dave for getting me sorted out. My first ever fight was against Stoink!!! And Friends. I spent most of the fight getting the controls mixed up before I was mercifully pushed into the pit. I feel a bit bad for putting up such a rubbish fight, but I'm only a beginner! The second fight was against Philippe Flop, who happened to be on the table next to me. I think I was a little better composed for this fight, although the bot wasn't behaving itself. The left-hand motor was rotating before the other, making it veer to the right. Nothing was snagging, and trim didn't seem to make much difference, so I'm not sure what's going on there. Despite that, I put up a better fight, and tried to use the lifters to snag and drag (heard someone shout "spike him!". hehe), but couldn't seem to get much power down. Thinking about it, I might've been getting the wheels off of the ground by driving up the wedge, which was a bit silly of me. Back into the pit with me! So thanks to my opponents for giving me a sound thrashing. I have learned a little bit, and hopefully won't be so easily fought next time. I'm looking forward to the videos, to see what actually happened. So much for front flipping. Back to the axe idea!